Clear acylic construction is highly durable and creates a clean professional look. 3 compartments make it easier to organize items. Helps keep lids consolidated and easy to access. 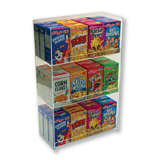 3 tiers allow you to display multiple items and organize them within one display. Rear hinged door gives easy access to products. Clear acrylic is highly durable. 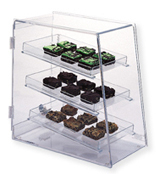 Clear acrylic construction is highly durable and easy to clean. It also allows your customer to easily view items from all angles. Maximizes use of vertical space. 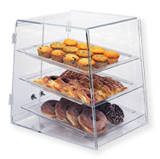 This pastry case tray is constructed of durable and easy to clean clear acrylic. 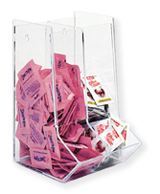 Clear acrylic also allows customers to easily view the items on display. Clear acrylic construction is highly durable and easy to clean. It also allows your customer to easily view items from all angles. Easy access to items stored as well. 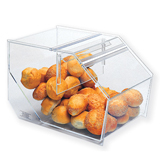 Clear acrylic construction is highly durable and easy to clean. It also allows your customer to easily view items from all angles. 2 compartments allow you to separate items of different types. Clear acrylic construction is highly durable and easy to clean. It also allows your customer to easily view items from all angles. Hinged rear door gives easy access. 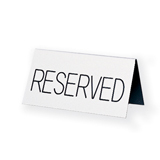 This is a "Reserved" table top sign, with card and menu holder. It measures - 4.3675"w x 3.5"h. Acrylic construction grives a clean professional look. 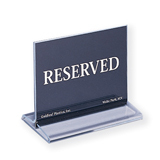 This is an engraved, "Reserved" table top tent. It measures - 3"W x 1"D x 1.5"H. Construction is very durable and easy to clean. Black and white creat an easy to read contrast. This is a glass green, restaurant condiment caddy with menu holders. Helps to consolidate items for easy access and organizational purposes. Easy to clean.